An introduction to the formal study of Islamic beliefs through a traditional manual of Islamic theology. Take this course to understand the basic methods of Islamic logic and how to use them to gain evidence-based conviction in Allah Most High, His attributes, His messengers, and the afterlife. This knowledge that you will learn in this course is the context that will give your life its purpose. This is a second-level course in Step One. Take this course before all courses in Step Two. Course Format: 12 downloadable lessons, 3 live sessions. 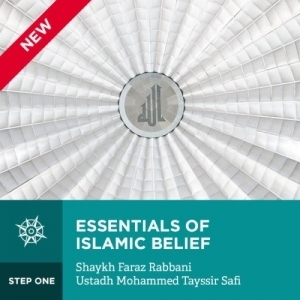 An introduction to the formal study of Islamic beliefs through a traditional manual of Islamic theology. Take this course to understand the basic methods of Islamic logic and how to use them to gain evidence-based conviction in Allah Most High, His attributes, His messengers, and the afterlife. This knowledge that you will learn in this course is the context that will give your life its purpose. The course is an explanation of al-Kharida al-Bahiyya (“The Lustrous Pearl”), an introduction to the science of Islamic theology by the great theologian, spiritual master, and foremost Maliki jurist of al-Azhar, Shaykh Ahmad al-Dardir (d. 1201 A.H. / 1786 C.E.). The Kharida is a 71-line didactic poem that, in its own words, is “slight and small in size, but great in knowledge.” For hundreds of years, it has been studied and memorized by beginners of Islamic theology, and is frequently quoted by students and teachers alike because of its pithy expressions. A downloadable copy of the course text in both English and Arabic is provided as part of the course materials. A long time resident of Ann Arbor, Mohammed grew up in an Arab American family with Damascene roots. Although Mohammed was born in Dubai, his parents, Nariman Zarzour and the late Dr. Mohammed Fayez Safi (May God envelope him in Mercy), moved to the United States six months after he was born. In 1994, the Safi family settled in Ann Arbor, Michigan where they have remained since. Mohammed attended Ann Arbor’s Pioneer High School, graduating in 2002. He graduated from the University of Michigan–Ann Arbor in 2006 as a double major in Political Science and Middle Eastern and North African Studies. He spent the next 3 years of his life traveling the Middle East, completing the Arabic program, CASA, in Egypt and pursuing private studies in Arabic linguistics and introductory Islamic sciences. His brief introduction to Islamic studies continued for another year at the Dar al-Mustafa Institute in Tarim, Yemen. Since his return from the Middle East, Mohammed has mainly worked as a Youth Director in Canton, Michigan for over two years. He is currently enrolled in an MA program at the University of Michigan titled, Teaching Arabic as a Foreign Language. He will be finishing the MA in April of 2013, God willing. Mohammed also teaches Arabic at the University of Michigan. Apart from classes at the University of Michigan, Mohammed studies at the hands of Muslim scholars privately in multiple sciences including linguistics, law, and theology. Mohammed’s main interests include education, community building, language, Arabic, cultural studies, the Qur’an, and all fields related to spirituality and faith. He hopes to continue his education both within the academy and privately while striving to serve humanity in hopes of fostering healthy and vibrant families and communities.